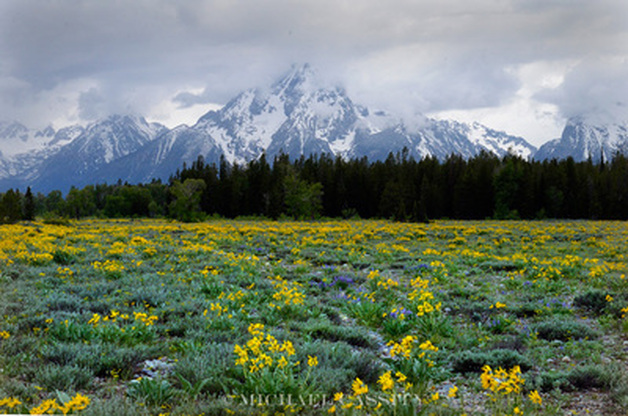 Above: Sunrise: The Grand Teton, June 16, 2014. © Michael Cassity. The summer solstice is, and has been for the eons of natural history, an important, vital time of the year, almost literally the dawn of a new day for earth’s living beings as they move into new phases of their (and our) cycles of life. In Wyoming it is even more pronounced a time of rebirth and renewal since three seasons (and sometimes four) are often compressed into a single week around the solstice, or even into a single day. The images below seek to convey a little of that magical time, all of them being made in the week leading up to the longest day of the year, 2014. Some people, understandably, prefer the sunny days of high summer, but I am drawn to the reminders of how life is in constant change, I am pulled to the dark so as to better appreciate the light, I find solace in the cold in anticipation of the warmth to come. Step into the week of the solstice and savor life taking new shape all around you: the rebirth, the renewal. It is also a moment of reflection on deeper parts of life. Wendell Berry, "The Wild Geese"
Click on the picture below to start the four-minute slideshow.